I found this article on purpleclover.com really fascinating: 20 Exotic Words That Don’t Exist in English. I think “gokotta” and “komorebi” are beautiful. An argument for solitude and a definition of inspiration: check out this post on brainpickings.org by Maria Popova about Agnes Martin’s approach to her art and the nature of creativity. Inspiration will strike when the mind is untroubled and often takes us by surprise. And she advises to keep your friends out of your studio, unless they are friends of your art. Interesting woman who was unfamiliar to me before this excellent article. I believe that if you are journaling, the “how” doesn’t matter: handwritten or typed, at least you are getting in touch with your thoughts and emotions. 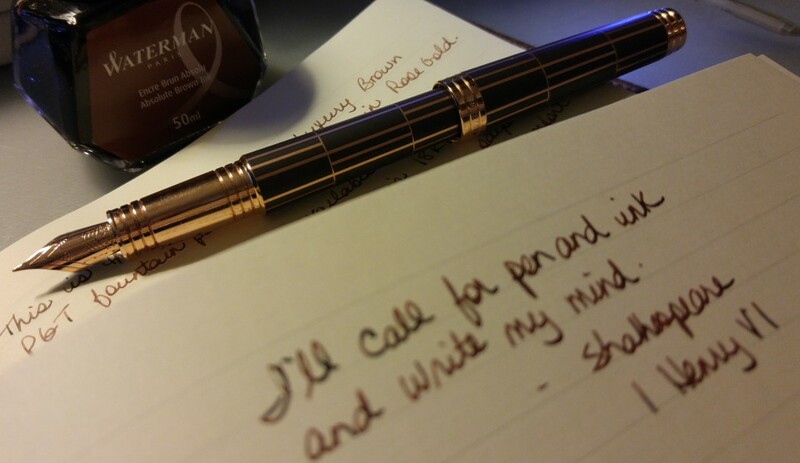 I prefer writing by hand, even though I can type faster than I can write. Dolly Garland, in her post from kaizenjournaling.com, gives some beautiful reasons why hand written journals trump e-journals. I agree with Dolly in that a physical journal just gives you so many more options, with stickers and ink colours and ephemera. Good read. We’ve all done it: fallen off the wagon of the habit we’re trying to establish. Nish over at inkycauldronblog.wordpress.com talks about the daily journaling slump and how she found creative ways to move past it. Great photos of her Hobonichi drawings too. I found a book I want to read: David Whyte’s Consolations: The Solace, Nourishment and Underlying Meaning of Everyday Words. It’s “dedicated to WORDS and their beautiful hidden and beckoning uncertainty.” It’s a dictionary of sorts, where Whyte delves into the deeper meaning of 52 words, like ambition, courage and heartbreak. In this brainpickings post, Maria Popova examines the beauty of Whyte’s efforts, and draws parallels to the great minds of our time. The excerpts from Whyte’s book read like poetry. Beautiful. I just put it on hold at my library. I started out tonight with an entirely different post in mind. Last week I received a notebook at work as a token of appreciation for Administrative Assistants Day. I am not what you might think of as an Administrative Assistant; I frequently refer to myself as an editor and that is how I am known in my group at work. My official title is Report Production Coordinator which involves quite a bit of word processing. Anyway however you want to describe it we editors were invited to join in on the Administrative Assistants Day fun, with a lunch and the presenting of a present; the afore-mentioned notebook. This is the fifth notebook I have received while working for my company; the others were presented as thank-yous or gifts for something or other. So I wanted to show you pictures of these notebooks but then I realized I forgot one of them at work (I actually do use one or two of them, at work). So that’s a post for another day. In my despair at it being almost bedtime and my topic thwarted, I started reading this post from brainpickings.org. called Famous Advice on Writing: The Collected Wisdom of Great Writers. That was over an hour ago. So many great jumping off points in this article: Mary Gordon on the Joy of Notebooks and How Writing By Hand Catalyzes Creativity (omg was there ever a more perfect article for me?!? ), Joan Didion on Keeping a Notebook, and The Daily Routines of Famous Writers, just to name a few. This hopscotching through articles could go on for some time. I want to write everything down in my journal but that would take weeks. Months maybe. And my apologies if I’ve already touched on some of these articles previously on here. There are over 600 posts now and I find my memory failing. I seem to recognize certain quotes but not others. So be indulgent with me if I repeat myself. I hope you have as much fun as I did reading these amazing and inspiring articles. And then go write in your journal and just see what comes. You’ll be happily surprised, I guarantee it. Okay so a couple of really great sites to share with you tonight. Why you should is an offshoot of Medium.com, which is a collection of essays pertinent to modern life. I like the fact that they tell you how long a read each one is. I loved Why you should write by Drew Hoolhorst and will be copying the entire thing into my journal tonight. I hope you enjoy the site as much as I have. … it should be enough to know that when you write something, anything, it’s like a lottery ticket. Someone could read it and could laugh uncontrollably for the best of reasons. Someone could read it and become violently angry at your view on something (or your “non-view” for that matter). Someone could read it and feel absolutely nothing. And any one of those things is spectacular. And then we come to Brain Pickings. This is a website that offers a weekly digest of great articles. And they recently published an article called Why I Write: George Orwell’s Four Universal Motives of Writing and Creativity by Maria Popova. Now I have read the original Orwell essay years ago but I still found this article interesting, especially because the amount of great info in the first paragraph alone will keep me copying into my journal for a week! All writers are vain, selfish, and lazy, and at the very bottom of their motives there lies a mystery. Writing a book is a horrible, exhausting struggle, like a long bout of some painful illness. One would never undertake such a thing if one were not driven on by some demon whom one can neither resist nor understand. For all one knows that demon is simply the same instinct that makes a baby squall for attention. And yet it is also true that one can write nothing readable unless one constantly struggles to efface one’s own personality. Good prose is like a windowpane. I cannot say with certainty which of my motives are the strongest, but I know which of them deserve to be followed. And looking back through my work, I see that it is invariably where I lacked a POLITICAL purpose that I wrote lifeless books and was betrayed into purple passages, sentences without meaning, decorative adjectives and humbug generally.